Source: Hapsgood, I., trans. (1831). The Hunchback of Notre Dame. New York: Carey, Lea, and Blanchard. The novel begins in Paris during the Festival of Fools. At the Palace of Justice, Pierre Gringoire prepares to present his play to the people. The people are not impressed by Gringoire's new work. The Cardinal finally makes his appearance. The Cardinal's appearance signals the end of Gringoire's play and the crowd turns its attention upcoming election of the Pope of Fools. Coppenole convinces the Parisians to run the election as they do in Flanders. Quasimodo is elected Pope of Fools and is subsequently paraded through the street on a mock throne. Gringoire's attempt to perform is play is interrupted by the appearance of La Esmeralda. Gringoire, broke and depressed, walks the streets of Paris, eventually ending up at the Place de Gréve. The narrator provides a bleak, but thorough picture of Place de Gréve. Gringoire watches Esmeralda, as she performs for the crowd. A mysterious stranger accuses Esmeralda of sorcery. Quasimodo's participation in the festivities comes to an end. Gringoire decides he will follow La Esmeralda. Quasimodo makes a sudden and unexpected appearance. After regaining consciousness, Gringoire continues to seek lodging for the night. After a run-in with a group of beggars, Gringoire is take before the "King". In order to avert a tragedy, Esmeralda agrees to marry Gringoire. Gringoire finally gets some rest. The narrator presents a more thorough history of the Notre Dame cathedral. The narrator gives a detailed description of Paris and its ever-changing architecture. The abandoned young Quasimodo is taken in by the priest, Claude Frollo. Rumor of sorcery are spread about the priest. Claude Frollo's destiny is predetermined, but unforeseen events deeply affect his love and devotion to others. The year is 1482 and by virtue of Claude Frollo's promotion to archdeacon of Josas, Quasimoto has been appointed the bell ringer, a position that brings him great pleasure as well as great pain. Quasimodo's love for Claude Frollo is examined further. As time passes, Quasimodo grows up, and an aging Claude must reconcile himself with his choices. A description of the citizen's reaction to seeing Claude and Quasimodo walk the streets surrounding Notre-Dame. Claude Frollo receives a visitor in his laboratory. Jacques Coictier, accompanied by the aging Father Tourangeau, is shocked by Claude Frollo's views. As he departs, Father Tourangeau divulges his identity to Claud Frollo. The narrator explores Claude Frollo's statements concerning the printed book in his laboratory. Robert d'Estouteville heads to court, where Deputy Florian is already holding court. The terribly deaf Deputy Frollo attempts to interrogate Quasimoto, causing much laughter in the courtroom. A more detailed description of the behaviors of mourning widows and mothers as well as some history of the cell of Tour-Roland. As Quasimoto awaits punishment, two Parisian women and a country woman compare the pillories of Paris and Reims before stopping to see a performance by Esmeralda. The country woman tells the story of Paquette-la-Chanterfleurie and her child. The women pay a tribute to the recluse. A crowd continues to gather a the Place de Gréve hoping to witness the day's punishment. The crowd assaults the deformed Quasimoto before he receives his punishment. Esmeralda fulfills a request by the injured Quasimodo. The recluse screams her disapproval from afar. Esmeralda flees the pillory upon hearing the recluse's curses. Fleur-de-Lys' and two young heiresses gossip in a house across from the Notre Dame in the presence of a young captain, Phoebus de Chateaupers. The captain, having been born into nobility, currently finds himself ill at ease in polite society. Phoebus, having witnessed a performance by Esmeralda, approaches her to discuss the actions of Quasimodo. Claude Frollo watches Esmeralda's performance, wishing to know the identity of her assistant. Having recognized Gringoire, Claude Frollo chastises him about his current occupation. Gringoire informs Claude Frollo of his wife and the strange events which lead to his nuptials. Quasimodo's passion for the bells greatly decreases following his punishment at the pillories. When his enthusiasm finally returns it is only for a brief period. Jehan Frollo discovers a strange scene in his brother's cell. Jehan's request for money is interrupted by the arrival of Maitre Jacques. Maitre Jacques enters the cell of Claude Frollo, informing him of the impending arrest of Esmeralda. The interaction of a spider and fly gives Dom Claude an opportunity to discuss fate with the attorney. Jehan encounters Captain Phoebus in the street and head off to find a suitable pub. Claude Frollo follows, curious at having heard the name Phoebus. Phoebus informs Jehan of his upcoming date with Esmeralda. Claude Frollo Disguises himself and waits for Jehan and Phoebus to finish drinking. Phoebus and an inebriated Jehan exit the pub. Claude Frollo passes by his drunken brother as he pursues Captain Phoebus eventually confronting him in the street. Claude Frollo secretly observes the interaction between Phoebus and Esmeralda, eventually intervening with violent measures. Esmeralda, having been missing for one month, is discovered by Gringoire in the Tournelle Criminelle. Esmeralda, having been accused of murder and witchcraft, is greatly troubled by the failing health of Captain Phoebus. Gringoire is shocked by the identity of the second defendant. Esmeralda is led to the torture chamber where her spirit is quickly broken. An emotional Esmeralda returns to the courtroom where a list of her supposed crimes are read aloud before she is sentenced. Her spirit broken, Esmeralda is taken to her cell, in the Tournelle. After some time has pased Claude Frollo visits the condemned prisoner, eventually professing his love for her. Sachette, the recluse, is overjoyed by news of Esmeralda's fate. Having been with his garrison for a period, the recovered Captain Phoebus arrives in Notre Dame as the crowd gathers for punishment of Esmeralda. Upon seeing Captain Phoebus, the condemned Esmeralda collapses just before she is rescued by Quasimoto. Claude Frollo, unaware of Quasimodo's intervention, retreats to the countryside for a period of reflection. Claude Frollo fears he has seen a ghost. Having been taken to a safe place by Quasimodo, Esmeralda recalls the events which have transpired. Quasimodo warns Esmerelda never to leave the church, fearing she will be killed. Esmeralda awakes the following morning to see her rescuer silently watching her. Aware of Esmeralda's love for Captain Phoebus, Quasimodo decides to grab the attention of the young captain. Claude Frollo, having discovered that Esmeralda is still alive, becomes jealous of Quasimodo. Claude Frollo's advances are once again rebuked. Claude Frollo ponders the darker side of human nature. As Esmeralda's love triangle continues to intensify, Quasimodo finds himself torn between his devotion to Esmeralda and his debt to Claude Frollo. Pierre Gringoire, currently studying architecture in Paris, is approached by a distraught and unhealthy Claude Frollo. Claude Frollo presents a plan to Gringoire that will allow the condemned Esmeralda to escape death. in turn, Gringoire proposes a plan of his own. Claude Frollo finds his brother waiting for him at the church, once again requesting money. The Truands, having armed themselves, gather at a local tavern. As midnight approaches, Clopin Trouillefou leads the rowdy mob into the streets. Quasimodo, still feeling uneasy from the previous weeks events, witnesses a gathering crowd approaching Notre Dame, and resolves to protect Esmeralda. Quasimodo defends the cathedral, killing many of the Truands in the process. Jehan, having climbed to the top of the gallery, encounters Quasimodo. King Louis XI, in Paris visiting, reviews the crown's expenditures, taking great pride in a specially designed cage in the Bastille. The Truand uprising continues as Gringoire is interrogated by the King. Having been set free, Gringoire goes to meet Claude Frollo. Commanded by Phoebus, the King's soldiers arrive at Notre Dame and engage the Truands in battle. Esmeralda, awakened by the Truand's attack, is visited by Gringoire and a cloaked stranger. Claude Frollo presents Esmeralda with two choices. An angered Claude Frollo takes Esmeralda to see the recluse. After discovering that Esmeralda has gone missing, Quasimodo searches the church over and over before returning to her cell. Quasimodo acts out in rage against his master after witnessing the execution of Esmeralda. Claude Frollo's body is removed from the street, but Quasimodo is nowhere to be found. Rumors abound regarding the archdeacon's death, resulting in the body not being buried in consecrated grounds. Gringoire achieves a level of success in theatre as Captain Phoebus is finally married. After a period of years, the skeleton of Esmerald, buried in the common vault of Montfaucon, is found embraced by a disfigured skeleton. Hugo, Victor. The Hunchback of Notre Dame. Lit2Go Edition. 1831. Web. <https://etc.usf.edu/lit2go/107/the-hunchback-of-notre-dame/>. April 19, 2019. 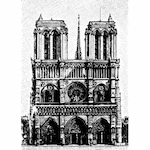 Victor Hugo, The Hunchback of Notre Dame, Li2Go edition, (1831), accessed April 19, 2019, https://etc.usf.edu/lit2go/107/the-hunchback-of-notre-dame/.